1. I should have packed more t-shirts. I've been wearing the same one for 3 days now. But we're doing laundry this afternoon! 2. Nicole could do without overnight sleeper buses. 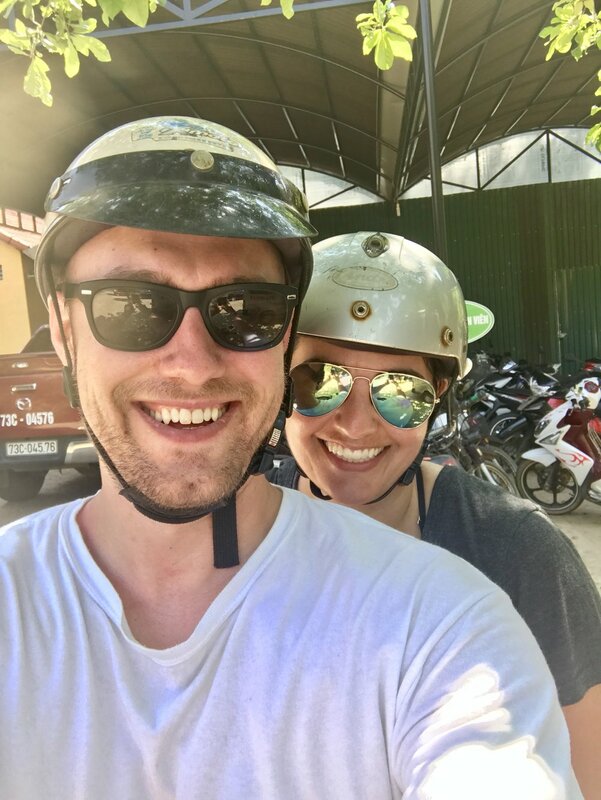 Because of an (unknown to us) national holiday weekend going on in Vietnam, we were unable to book a train from Hanoi to Phong Nha. So our hotel helped us book a sleeper bus. The good: $25/person. The bad: The "beds" would be fine if I were 5'3'' and skinny, and the bus comes with its own soundtrack, ie, the cell phone happenings of the other passengers and some of the craziest coughing I've ever heard. 3. 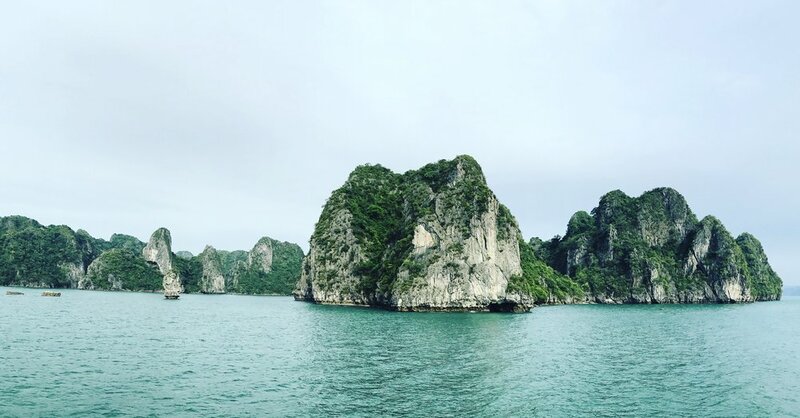 Ha Long Bay is the real deal. We booked a two night cruise on the Indochina Junk "Dragon Legend" boat. It is a "wonder of the world" for a reason, some of the most beautiful landscapes I've ever seen. 4. We could live in Hong Kong. Only my second time there, although Nicole's been a handful of times. It's great. Lots going on, nice people, good food. Also, because Nicole is a frequent flyer ninja, we got to hang out in the first class lounge at the HK airport, which was old hat to Nicole but eye-opening to me compared to domestic lounges (and which also could be the reason Nicole has gone soft and soured to experiences such as #2 on this list! :)). 5. Hanoi public transit is fantastic. We regularly took public buses and found it very easy (and cheap) to get around. The only shaky time was our trip from the airport to the hotel. We were the only people let off the bus at our particular stop. It was dark and we were on the side of a highway unsure if this was in fact the right stop. But after a few frenzied minutes on Google maps, it turned out we were a short walk to our hotel. 6. 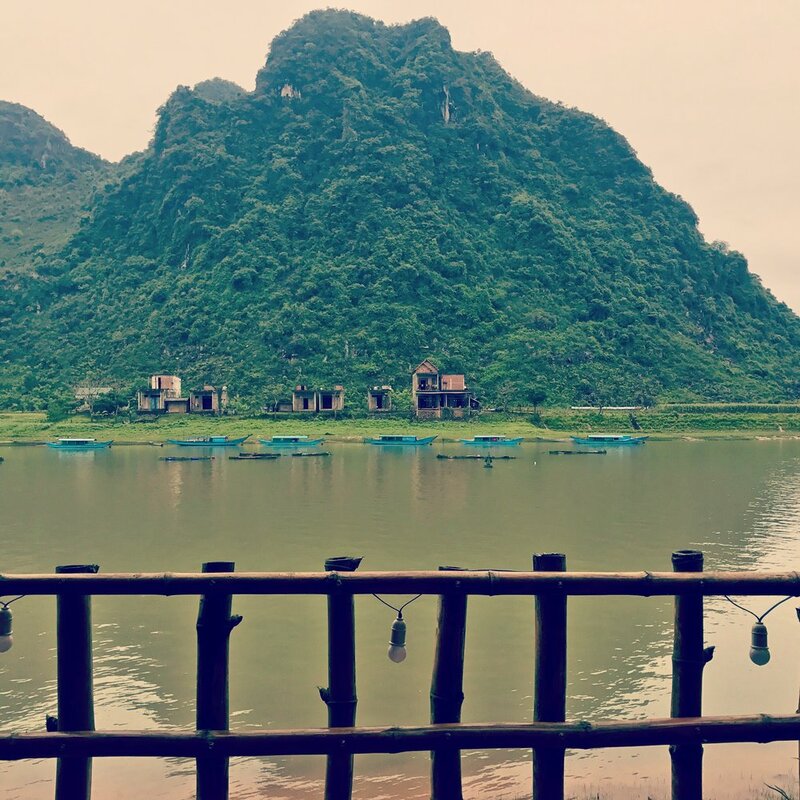 Phong Nha for the win. We just arrived at 5am this morning on an overnight bus (see #2), but this village in a national park is stunning. Also, our hotel sent a woman on a scooter to the bus stop to pick us up which was fun. She put Nicole's suitcase in front of her and Nicole on back, made a quick run to the hotel, and then came back to get me. The following pic is the view from where I'm writing this.